This sofa table will become a lovely addition to your living room. A solid wood top is featured with riveted edges. Scrolled metal base with cabriole feet is features to add a elegant appeal. Place this sofa table behind your sofa, against a wall or below a mirror to create a stunning accent in your home. Decorate with can;es, lamps, framed photos, artifacts and more. The Crowley Traditional Scrolled Base Sofa Table by Steve Silver at Walker's Furniture in the Spokane, Kennewick, Tri-Cities, Wenatchee, Coeur D’Alene, Yakima, Walla Walla, Umatilla, Moses Lake area. Product availability may vary. Contact us for the most current availability on this product. Wood & Finish Medium brown wood finish. Case Detail Scrolled metal cabriole legs. Textured table edges. Case Construction Constructed from hardwood solids and metal. Crowley will bring a timeless and elegant appeal in your home and transform it into a stylish traditional atmosphere. This set of occasional tables features solid wood tops with riveted edges and metal bases. 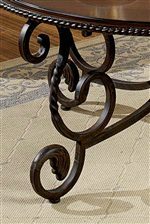 Scrolled metal with curvy details and leaf motif will bring a classy flair to your home. Place these tables around your living spaces, entry way, den, library or anywhere in your home. The Crowley collection is a great option if you are looking for Traditional furniture in the Spokane, Kennewick, Tri-Cities, Wenatchee, Coeur D’Alene, Yakima, Walla Walla, Umatilla, Moses Lake area. Browse other items in the Crowley collection from Walker's Furniture in the Spokane, Kennewick, Tri-Cities, Wenatchee, Coeur D’Alene, Yakima, Walla Walla, Umatilla, Moses Lake area.